UNESCO Bangkok recently visited schools that are part of the pilot three-year Non-Formal Middle School Education (NFME) project in Myanmar, which targets 14 to 16-year-old children who do not have access to formal education. The project, currently funded by the Korean National Commission for UNESCO, is expected to end in May of next year. Here, three student share their stories about being out of school and the importance of hope. When Myant Thinzar Lwin, now 17, first shared her story with UNESCO in December of 2016, she was not optimistic about her future. After moving from her hometown to Hlaing Thar Yar Township in Yangon, she was unable to continue her formal education as her previous school had not provided her with the card she needed to change schools. She went to work at a factory in a grueling job that left her with headaches and frequently depressed. The NFME programme offered her a chance to leave the factory and continue her education; however, one year later she was on the verge of dropping out. “I had to leave school for a month to work at the factory,” she says. As difficult as last year was for her, Myant Thinzar Lwin was able to stay in the programme. “All of my friends and teachers welcomed me back when I returned,” she says. “I’m happy.” She hopes to complete the NFME programme and transfer to a formal school next year. Myant Thinzar Lwin has wanted to be a teacher since she was young and spends her free time teaching out-of-school kids in her neighborhood. She believes that education helps people to be “respectful and responsible” and that its reach can and should extend to all. Myant Thinzar Lwin is not the only one in her family with a passion for education. 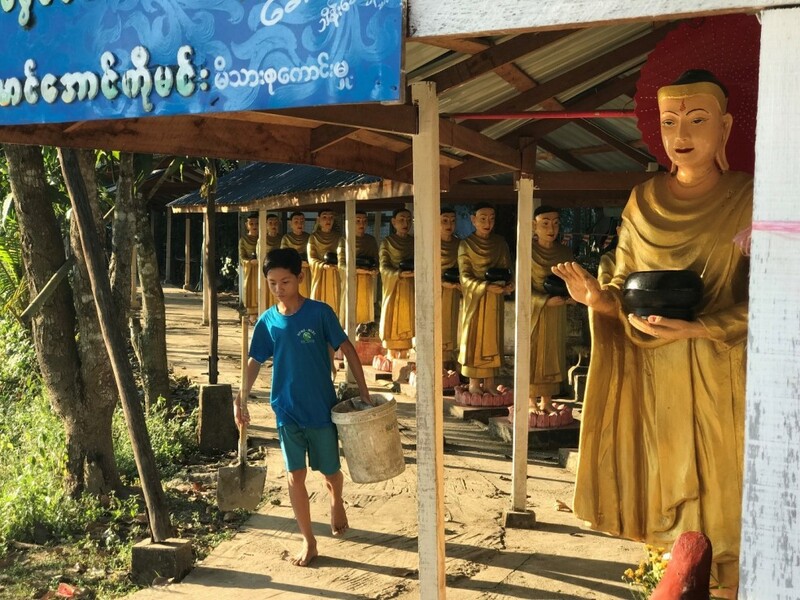 Her brother Nada Aung, 13, who faced the same difficulty as his sister when trying to switch schools, now balances his studies in the NFME programme with trying to help his father support their family. “Although I’m the youngest in my family, I have my own responsibilities,” he said. 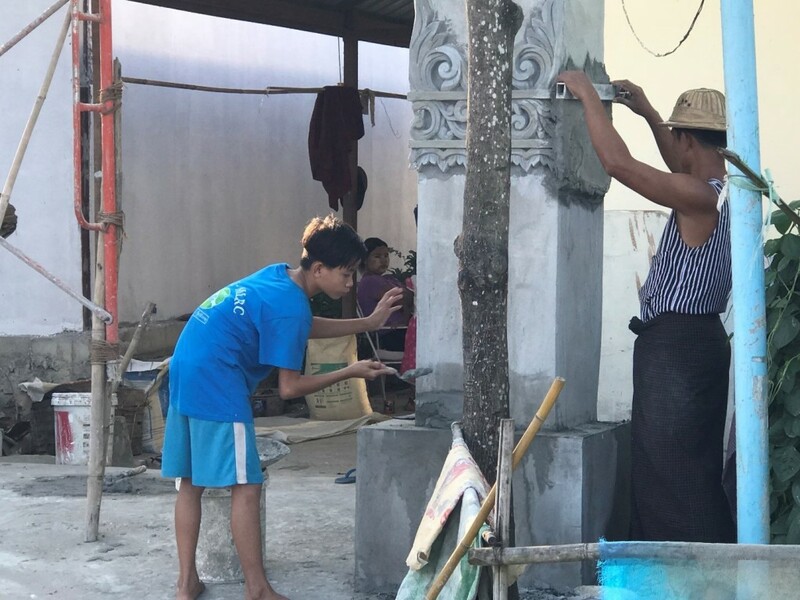 On weekends, Myant Thinzar Lwin wakes up early in the morning to assist his father at temples and construction sites, doing simple jobs like carrying bricks or helping to mix concrete. Nada Aung is keen to help his dad, but wants to continue his education, which he says helps people achieve their dreams. “I want to try my best and become a role model for upcoming students,” he says. His main concern now is that his school will close and he will lose this opportunity, as the project is still at the pilot stage. Thant Zin Phyo’s mother passed away shortly after his family moved to Hlaing Thar Yar, and his father died shortly after. 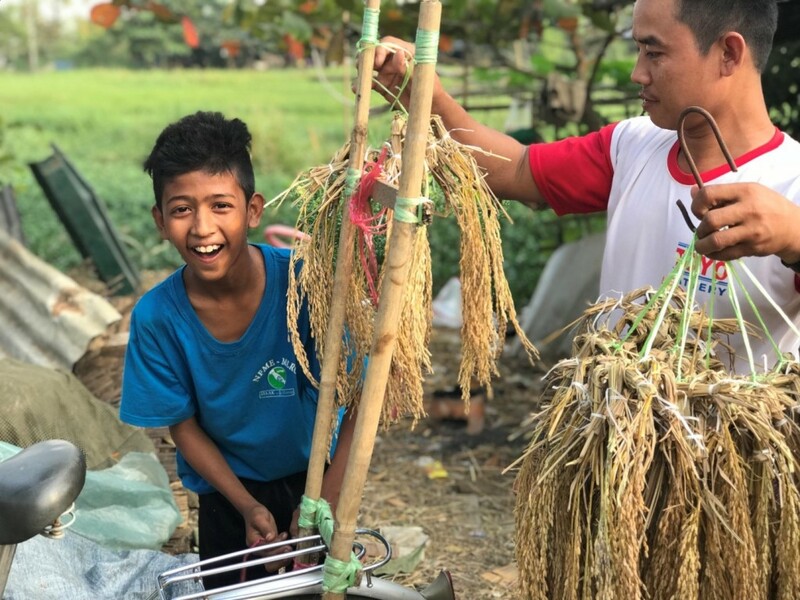 Like his classmates, Thant Zin Phyo, 13, joined the NFME programme because he was unable to transfer to a formal school in Myanmar. He now lives with his grandmother and 13 other family members in a very small space. With both parents gone, he feels even more pressure than his classmates to earn money. As busy as he is, he says school makes him happy because he can hang out with his friends and learn. “One day,” Thant Zin Phyo confides, “I want to be a doctor so that I can help people like my parents, who passed away.” This is one of the reasons he continues to go to school despite the challenges he faces. Story and Photos: Hyunjeong Lee, Programme Officer – Non-Formal Education/TVET. The interviews were conducted with support from the Myanmar Literacy Resource Centre, a Yangon-based organizations that promotes education for out-of-school children, and translations were provided by Thiri Kyaw, a former Intern with UNESCO Bangkok’s Technical and Vocational Education and Training (TVET) team. The NFME programme is currently focusing on six townships in Myanmar, two of which are being supported by UNESCO Bangkok and the Korean National Commission for UNESCO. The development of the programme and its curriculum and teaching-learning materials were supported by Japan’s Ministry of Education, Culture, Sports, Science and Technology.